Anchor Saver® LLC. | Dont lose another Anchor, release it with Anchor Saver. 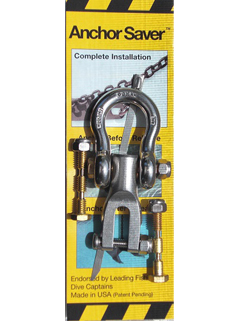 Anchor Saver® is a Stainless Steel Anchor Release Device Designed to Function with your Existing Anchoring System. When needed, it will Release and Retrieve a Stuck Anchor. This Unique Product includes a Custom Engineered Stainless Steel Shackle, Cable, Release Bar and (3) Calibrated Release Bolt's and is packaged with everything you need for your installation. The Key to this Anchor Release System is the Combination of the Engineered Components and the Concept we call “Indirect Anchor Pressure”. When your Boat is at Anchor, there is No Pressure on the Release Bolt. Therefore, we use the term “Indirect Pressure” Since the Pressure is Directed through the Shank To the Crown of The Anchor. This does not in any way diminish the effectiveness of the Anchor Set. Our Release Bar Allows us to Float the Shackle within the Shank Eye, thereby Eliminating Any Direct Pressure on the Release Bolt under normal anchoring conditions. Complete Direct Release Pressure is required for an Anchor Release. Firstly, It is initiated when you position the boat above the anchor and secure the rode to a forward cleat, allowing extra Rode for Wave Action. Next, move slowly but deliberately forward, IN THE DIRECTION OF THE ANCHOR SET. 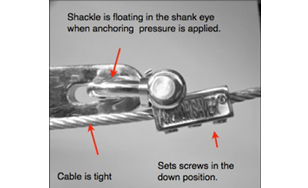 When you achieve the Pre-Determined Breaking Point the Calibrated Release Bolt will Shear, causing the attachment point to Switch from the Shank Eye To the Crown and Drawing the Anchor out of its obstruction.